Can someone please tell me where I can get the box of 24 packs and how much does it cost? On DWMI’s Shop – https://www.dbfactory2.co.uk/secure/drwho_bbc/single_cards/card_cdus.asp?itemData=item=0x0 – £36 with free delivery. Though you might find something cheaper if you look on ebay / Amazon. 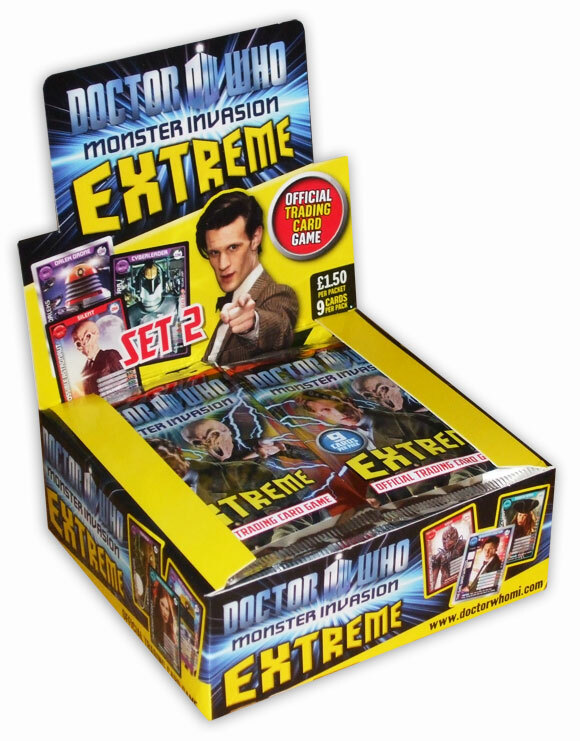 That’s ok. There’s one here on ebay – http://www.ebay.co.uk/itm/Doctor-Monster-Invasion-Extreme-Set-2-Trading-Cards-Full-Box-24-Packets-/230722002273?pt=UK_Collectables_TradingCards_RL&hash=item35b81a5d61 – only £12.99. If your buying I’d go for this. Well i mean from the shops. I reckon that they will either try to match these prices or go even lower. I know. I was on amazon today. 4.99£ for an ultra rare?! I would pay at least 399£. £399 for an Ultra Rare? Are you being serious??? I was going to say, you could get the Infinite cheaper! I know. I wish they could print about 500 infinites but not cheap. About £150! I would save up and I could easily, cause in Christmas I had about £230!! Oh and the autographs about 70-100£. 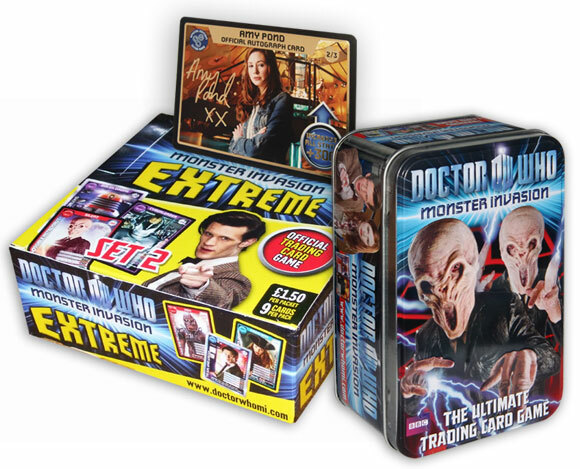 The autograph cards could not cost that much, maybe the Amy one but the Doctor card comes with issue 11 (which you can get from their website for £3.60 if you include postage) and the Rory can be found in tins for £9.99. You can’t get issue 11 on back issues. I don’t know why..
Error on the website, you can still get it using other means. Lucky! That’s my fave ultra rare and I don’t have it. I wonder when i’ll get my first one… How rare is an ultra rare?? An Ultra Rare is 1 in every 10 Packs. Nice, what do you think of the CB Tardis Mega Playset? Hard to build? I remember it taking me ages! Well, I tried it in Scotland and ended up braking it up, as I was building it on the carpet and it was difficult. I’ve not started it yet, but I am soon. Before I built it i loved swapping there heads around. Rory on Amy was funny!! Mine kept breaking while I was building, but I got there in the end! Just tried Rory on Amy myself, it’s funny 😆 ! I know. What’s your favourite doctor who toy or anything related? Mine will have to be MI and Amy Pond. Im glad she’s the companion!!!! Well I agree on MI, I’m really liking that at the moment. The other thing I’m liking the look of are some of the new Classic Figure Sets, I haven’t gotany Classics yet. Only problem is, there a little expensive, so will have to wait and see about them. because I haven’t seen any classics, I’m not interested but some look good. I want to see the third doctor and fifth! You should try getting hold of some Classics to watch, you’ll be suprised how good they are! Actually, I’ve seen some. I have doctor who the movie and the first Doctor’s An Unearthly Child. I only liked the mOvie though. The first doctor isnt good. Who are your top 5 favourite companions? 1) Sarah Jane Smith, a brilliant companion, a shame we lost her. 2) Amy Pond, a really good companion, though shes leaving next year. 3) Ace, loved watching her hit Daleks with Baseball Bats 🙂 . 4) The Brigadier, loved his appearances in the Classics and it was nice to see him in SJA, but again, it’s a shame we lost him. I liked his tribute in The Wedding of River Song though. 5)Rory Williams, it’s just funny watching him be hopeless! Good choices, what else shall we talk about? Emmm…. Let’s talk about monster invasion and…oh! When are you back at school? I’m on Monday and also im writing on my iPod right now and I’ve got Internet problems so if I go off its cause of that. You lucky guy, I’ve already been back at school a week, when did you break up? And with Monster Invasion, I’ve just looked over them and seen the ever growing pile of doubles, and double doubles, and double double doubles and… I think you get the point. Do you have the same problem? Greek schools stopped on the 23rd, but I stayed off on the 22nd cause I left for holidays in scotland. What about you?? Favourite – Peg Dolls – Scary and my favourite episode! Scariest – The Flood – the rock mouth and water on his body with weird eyes? Too scary!!! Deadliest – I would say its the Silence. Yuckiest – Jennifer’s Ganger – That was yucky when she grew in to that monster! We went off school on the 16th, and I didn’t do much in the holidays, I was tired. I’ve just finished my first term at Secondary School, what about you? As for favourite monsters, I think I agree with you. If I had to choose, your choices would be the same as mine! The Peg Dolls look epic, the Flood are just freaky, the Silence are the deadliest monster the Doctor’s faced yet, and the Jennifer Monster just looked horrible! So when do you have holidays again? Mine are in Easter, but I’ll be going to ScQotland at the end of February to check out the schools and all that! Oh and I also thought, when they bring out MI set 3, I don’t think they should be available as single cards straight away, or else everyone will buy from there instead of the packs! I’m really not sure when we have holidays again, but I just hope they come soon! And I agree, they shouldn’t bring Set 3 out as individual cards straight away, at least give people a chance to buy a few packs! Exactly. And hopefully it will be the set that I will complete! We are probably the two people on this page that we wrote the most comments. Maybe about 40! I like your suggestions by the way! Oh did you check my cards? Just scroll down. Are you Dalek Supreme, because his are the only ones I can see? Yes I am. First StetsonsAreCool, then Dalek supreme now Kaagh. And I’m the person from Greece remember? Yeah, I know about the Greek thing, didn’t realise you were StetsonsAreCool and Dalek Supreme. Anyway, looks like you have a good selection of cards there! I remember that, I was wondering what you did with it! Great hiding place 😆 !!! I’ve done a mistake. Krynoids are already as a card! I just discovered that the infinites will not be in the single card shop for sure. But we still dont know about the special editions, most likely the Amy autograph will not be but the Rory, the doctor and the exploding TARDIS could be. On the doctor who monster invasion issue 17 page. Someone had sent an email and they replied that they will not have because only a few printed. So surely that will happen to the Amy autograph. I agree with all of them except wooden king 3d AND wooden queen 3d. Make a wooden people 3d. I’d rather there not be any cards on the christmas special. Booboo when will you post issue 19 and what’s inside it?? Thanks but the episode guide was really what I wanted. That’s the only one we can’t work out at the moment 🙁 , but hopefully someone will recieve Issue 19 soon and will be able to let you know 😆 . Booboo I just want to ask in issue 6 there is a slamdown with Gangers VS Scarecrows. If the Gangers won, then what was down in the corner as a card?? It couldn’t have been Gangers cause set 2 wasn’t out. Nothing was there, they just left it as a Card hadn’t been made yet. When is set 3 supposed to come out?? I hope it’s in summer so I can complete set 2 and start properly set 3, as I live in Greece. Can someone please tell me? Someone please answer my question! Oh and I am Dalek supreme I just changed my name. Thank you. Also which cards do you still need booboo and which card do you have the most?? I need many more and I have 3 uvodni. I bought a box of these, and Now only have 7 more cards to get from this set, and only 1 more from he first set, but planning to get that one card soon, so I should have 2 completed sets quite soon which will be nice, Love the cards and plan to collect all these magazines until the end. SOrry on 259 I ment to say Carrionites. I still haven’t got this. I Love the ‘Where’s the Doctor’ bit. I think next weeks ‘Battle Of Demons Run’ will be good! The only downside is, it’s £2.60 (as always) but I think its a bit expensive! I mean a price between £2.10- £2.50 would be best but! I love this magazine! It was the 12th, looks like they’re bringing it forward. It was always the ninth. I’m not Booboo, but no this won’t be exactly the same as the test Issue with the same cover. It features stuff from Series 6, which hadn’t been broadcast when the Test Set were released. Isn’t the cover for this the cover for the test set issue 1 ? Boo Boo, when are you putting this weeks DWA Issue up? And Did you know that The DWM Eleventh Doctor special: Volume Four is also out too? It’s really good! I recommend it! For Xmas i got every edition up to part 17 (the latest 1) so i am now up-to-date with it! I wanted to sart collecting when part 4 was out but mum said wait untill xmas. i did and i got EVERY SINGLE 1! That’s really quite cool. I have to pay for mine but I have a subscription. No this is out Wednesday 4th January 2012. Six days left! Yep..we are still awaiting delivery of issues 17 & 18. There has to be a distribution problem with subscribers. My other magazine subscriptions always arrive DAYS before they hit the shops. 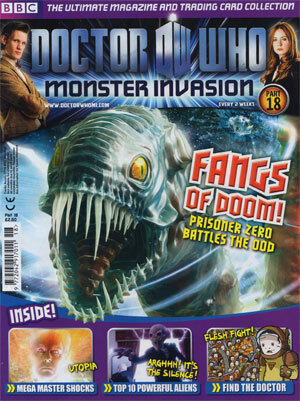 hay d,d,c 67 i just wanted to tell you that monster invasion mags are gona finish at issue 52. I don’t subscribe, I actually make a point of going to the shop. No offence meant. The Doctor Who DVD Files were supposed to stop at issue 28. Currently it’s on to issue 78, and is expected to run to issue 110. I am the same, apart from the fact that I am expecting issues 17 and 18 instead of issues 16 and 17. Isn’t this out next week??????? I am a subscriber but booboo would normally post them a few days before it’s out, Yet this isn’t due out till next week. I got 17 and 18 same time as you booboo. I meant this comes out in shops next week. I’m confused now lol. 🙁 You people who have recieved this are lucky, I haven’t even got Issue 13 yet! I’ve e-mailed them asking about it, apparently there was a problem with my account that stopped them being sent out. Thats suposively sorted, and I should be recieving Issues 13 – 18 all in one go so I can catch up. I was told they sent them out First Class way before Christmas, and they’re still not here! I don’t know what else to do? I dont get this any more, its not a great read. DWA is much better and has semi up to date news unlike this. I collect DWA & DWMI and I think: THEY ARE BOTH GOOD. if you don’t like DWMI read then just collect the cards. I get them both but I don’t like DWA so I canceled the subscription but for some reason they still haven’t stopped comin) When I canceled it they said you will still get them till the end of november but they’re still coming. DWA needs to do interviews. Actual interviews!! Indeed. I think they’ve now used all the Test Set covers.